Loon Lodge is a beautiful lakefront home. It is very private, settled at the end of a winding direct road in the woods, but just minutes from the bustle of Traverse City. It is perfect for families and couples looking to get away and relax. The house is right on Long Lake, one of Northern Michigan's most popular lakes for fishing, swimming and boating. The house has a dock and a large deck looking over the water. Loon Lodge is very secluded; the nearest neighbor is more than one hundred yards away, hidden by the trees. The property has more than 200 feet on the water. While many rental properties are bunched together, Loon Lodge is a private house in the woods. The house features two bedrooms and two bathrooms. There are two queen beds, two single beds and two day beds. The living room is large and spacious, with a cathedral ceiling. The eat-in kitchen is fully equipped. The house has hardwood floors throughout. Outside there is a new gas grill and fire pit. There is a canoe for your use, along with paddles and life jackets. You can also bring a boat; we provide a mooring and there is a public boat launch across the lake. There are public tennis courts within walking distance. There are also islands in the lake that you can explore, many with lovely beaches. The area has so much to offer, especially in the summer. The house is fifteen minutes from Traverse City, a lively and pretty town with shopping and festivals. Interlochen Music Camp, the Sleeping Bear Dunes, the Platte River, and Michigan's finest wine country are all close by. My grandparents purchased land on Long Lake almost 100 years ago. The property is still owned by the family. We also own the nearby woods; we protect the area. It is a unique and special retreat. We rent the property a few weeks each year to help cover the rather large Michigan property tax bills! Loon Lodge feels like a remote retreat, nestled deep in the woods. In reality, it is just 15 minutes from lively Traverse City. Our home has three very special features. First, it is right on Long Lake, a spectacular northern Michigan lake. The water is clear and the sunsets are beautiful. Loons nest on the lake, and you can often hear their haunting calls. The lake is great for swimming and boating. Second, the house is very private. It is situated in the deep woods on a huge lot with lots of lakefront. Third, the house is near Traverse City, so while it feels like you are really away from it all in the deep Michigan woods, you can get to a store quickly if you run out of flour or want to go to a movie. Loon Lodge is directly on Long Lake, one of the cleanest and most popular lakes in Michigan. The house has a dock and a mooring for your boat. There is also a deck looking over the lake. The house is on the shores of Long Lake! The house has a new furnace that works well. Nice for chilly evenings! We provide sheets, pillows, comforters and blankets. The washer and dryer are both new. Two fireplaces! One in the house and a pit on the deck overlooking the lake. Great for smores. A traditional drip coffee maker. The kitchen is fully stocked with pots, pans and utensils. There are two eating areas: a kitchen nook and the deck. We have Direct TV so lots of viewing options! We have Direct TV and high-speed internet. We have a new canoe for you to use on the lake. We provide a canoe, along with paddles and life jackets. Feel free to bring your pontoon boat, speed boat or sail boat. No jet skis please! The deck looks over the lake. It is a perfect spot to enjoy the lake scene and watch the sun set. There are public tennis courts within easy walking distance. There are a couple steps to get into the house. Northern Michigan is a vacation paradise. Traverse City is a charming town with a cute shopping district as well as all the usual larger retailers. The area is full of beautiful inland lakes, in addition to spectacular Lake Michigan and the Sleeping Bear Dunes. 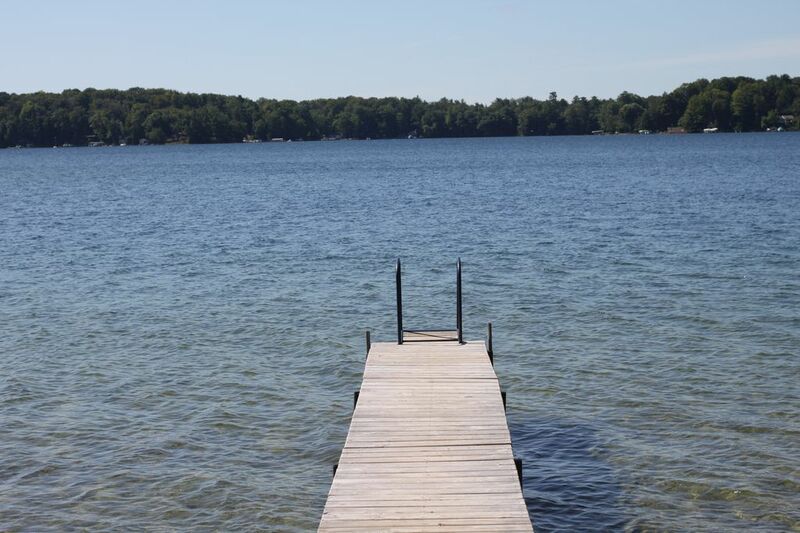 At the house, you can swim in the clear waters of Long Lake, lay in the sun, paddle around the lake (canoe provided!) and hike. There are five islands in Long Lake; they are all public and free, so perfect for exploring and picnics. Long Lake has great fishing, too. There are many attractions near by. The Sleeping Bear Dunes National Park is just twenty minutes away. The Platte and Boardman Rivers are great for canoeing. There are wineries, bike trails, Leland (a cute fishing village), hiking trails and breweries. It is a wonderful area.